SOMERSET COUNTY, NJ – Even though Somerset County is known for its affluence, there still are children and adults here who go to bed hungry. Freeholder Director Patricia Walsh is urging residents to help change that by supporting the 22nd annual Curbing Hunger Month food drive. State Sen. Kip Bateman, members of the Freeholder Board and food bank supporters joined Freeholder Walsh at the Food Bank Network of Somerset County to launch this year’s program, which will help boost food supplies there and at the Franklin Township Food Bank and other local food pantries serving Somerset County residents. 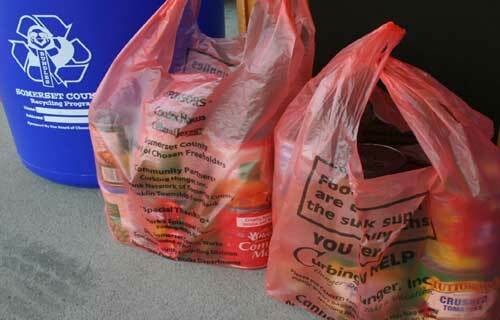 The Curbing Hunger food drive will be held in June to benefit organizations that help the hungry in Somerset County. There is an easy online donation option as well. Visit www.CurbingHunger2016.org to select and purchase food to donate; food items will be delivered directly to the local food bank by Amp Your Good, which is hosting the online drive on its website. Orange plastic bags were distributed to county households in May – look for them tied to the handle of your recycling container. You can use any plastic grocery bag if you didn’t receive an orange one. Place canned food donations in the bags and leave them at the curb on your regularly scheduled recycling collection days from June 6 through July 1. High on the list of needed items are Parmalat milk, canned meat and fish, “meals-in-a-can” such as pasta, stews and meaty soups, canned tomato sauce, canned fruits, and peanut butter and jelly in plastic jars. Perishables and food in glass containers cannot be accepted. If you miss either of your recycling days in June, curbside donations are collected year-round as well. Use one of the orange bags or any plastic grocery bag to place canned food at the curb on any of your recycling collection days throughout the year. Donations of non-perishable food also are accepted at the First Saturday of the Month recycling drop-offs held at the Somerset County Recycling Center at 40 Polhemus Lane in Bridgewater.